We prefer that counselors send high school transcripts to us through Penn State's Web Counselor System. If you are not part of the Web Counselor System, please consider signing up to become an electronic partner. Additionally, we can accept transcripts by mail or fax sent directly from the high school. We also accept transcripts sent through Naviance/Parchment, eScrip-Safe, or the National Student Clearinghouse. When sending fee waivers, please include the student's PSU ID number (if known), date of birth, and address to ensure that we are able to locate and apply the waiver to the correct application in our system. 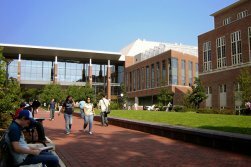 The Information Sciences and Technology Building (commonly known as the IST Building) is a classroom building at Pennsylvania State University. It is one of the newest buildings on the Penn State campus. Construction was completed in January 2004.